How Head Cottage Self-cateringA Grade II listed cottage dating from 1548, one of the oldest recorded buildings in Ambleside and reputedly built of cobbles taken from the Roman Fort at Waterhead. How Head Cottage sits in a pretty hillside location away from the centre of the village and yet just a short walk from the shops and restaurants. The cottage is perfectly placed for good walking from the door - The Fairfield Horseshoe, Wansfell and Loughrigg for the more strenuous and with Rydal Park and the riverside walks Under Loughrigg all easily to hand. How Head Cottage offers character accommodation for a couple in any season. Accommodation: Front door into L-shaped open plan living room with kitchen area at one end. Feature Lakeland stone hearth with gas burning stove (TV). Doorway opens onto the curving staircase. Upstairs there is one large bedroom with king-size bed and en-suite bathroom (bath with shower over, basin and wc). The cottage is comfortable, with fitted carpets. Deep set windows with oak lintels offer pretty views from upstairs. Storage heaters. Outside: On-street parking usually outside the cottage door. All village facilities within a few hundred yards down 'Peggy Hill'. Sorry no pets * non-smoking * Wifi not available * duvet/bed made up for arrival * electric cooker and hob * fridge * microwave * electricity included * travel cot and high chair available - please order * towels available - please order. The owners of this property are happy to offer a 5% discount for returning customers. Please mention when booking. 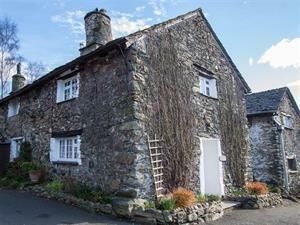 A Grade II listed cottage dating from 1548, one of the oldest recorded buildings in Ambleside and reputedly built of cobbles taken from the Roman Fort at Waterhead. Free Low Wood Leisure club pass. Children welcome from any age. How Head Cottage offers weekly bookings starting on Saturday. How Head Cottag offers weekly bookings starting on Saturday.